Genotoxicityof na extract of Calendula officinalis L.
In the present studies it was observed that the leaves of Calendula officinalis were oblong-lanceolate 517 cm long hairy on both sides and with margins entire or occasionally waved or weakly toothed (Table 1). A new extract of the plant calendula officinalis produces a dual in vitro effect: cytotoxic anti-tumor activity and lymphocyte activation, BMC Cancer 2006; 6 (1): 119. Studies on spasmogenic and spasmolytic activities of Calendula officinalis flowers. Aguila Gu B, Mendez Castillo R, Gonzalez Roque C, Fernandez Fernandez D, Extracto acuoso de Calendula officinalis. Tratamento de ulcera varicosa e lesoes de pele com Calendula officinalis L.
D) Para la siembra, se han utilizado plantones de Hypericum perforatum, Calendula officinalis, Taraxacum officinale y semillas de Trifolium pratense. The marjorams are coming into flower, the long row of golden yarrow looks amazing and the double row of pot marigolds, Calendula officinalis, that I planted earlier is a great success. Tamara Frankic, a nutritionist at the Zootechnical Department of the University of Ljubljana in Slovenia, and expert on dietary oxidative stress, points out towards the very promising work done on the antioxidant proprieties of Calendula officinalis Linn. Calendula officinalis ydi ei enw gwyddonol, a 'marigold' neu 'pot marigold' yn Saesneg. Calendula officinalis (pronounced cal-EN-du-la) fits all of these descriptions and more. 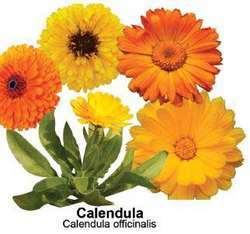 En semillas de calendula Calendula officinalis y de eneldo Anethum graveolens, se realizaron la descripcion morfologica y anatomica y mediciones del contenido de humedad en equilibrio (CHE).